28. My Internet does not work! How can I find the problem? See also: How are the network sockets identified? First check - are you trying to connect via the Wireless Network or the Wired network? Make sure you are not using UpUnet-S. UpUnet-S has a captive portal and require login. Forget that network. Do you not have coverage? In student areas - order new Wi-Fi hotspots via Netsupport. In department areas, the department has to order and pay for them. Use the wired network instead. Do you not have a link? If no link, check network cable. Throw away and destroy faulty Ethernet cables, even if only the little retainer tab is broken. If the link is down - has the network socket never been used before? Or was it a very long time ago since it was last in use? Contact your Local IT and activate the network socket. If there has been a switch upgrade in the cross connect cabinet recently, only the patch cables for the network sockets (or rather the switch ports) that has been used in the last year has been moved over to the new switch. If that is the case the network socket has to be activated again. Is the switch out of order? If the network socket suddenly stopped working with no link, maybe the switch is broken. Did the network suddenly go dark in some parts of the corridor and not on others? Then this may be the case. Contact helpdesk@bmc.uu.se. Is it really the network that is broken and not the computer? Try the network socket with another computer that is working with another network socket. This can help to identify whether the network socket is not working or if the problem is somewhere in the computer. Is the power out in the network cabinet? If Internet suddenly stopped working - it does happen that the power is out. It is not very common. The cross connect cabinets are usually located in the same part of the building that the lab or office housing the network socket. So go check if power is out. Are the lights on? If the power is out, just wait, Akademiska Hus is almost always already working on it. Do you have an IP-address? Check with ifconfig (Mac/Linux) or ipconfig (win). The IP-address should usually begin with 130.238 if you are at the university. Do you get intermittent link flaps? If the link sometimes goes down but not all the time this may be the case. Maybe the switch has put the switch port in link flap error disabled and then after a timeout period turn the switch port on again. Send message to helpdesk@bmc.uu.se or netsupports@its.uu.se. If you get a link but do not get an IP-address you may be on the wrong Vlan. You can listen on the network to see what traffic there is. Then you can quite often figure out whether you are on the correct subnet or not. This can be done in Linux with sudo tcpdump -n -i eth0 or on Mac with sudo tcpdump -n -i en0. (The network interface names may differ - check the names with ifconfig) For Windows Wireshark is a bit overkill but should work as well. As an administrator you can search for the MAC-address in NetDB to see how the switch port is configured. If you have a static IP, you have link, but cannot reach the gateway you may be on wrong Vlan. This may be due to switch upgrades or wrong configuration of the switch. Se above for possible ways of diagnosing this. Does the switch have that VLAN in the trunk? If the VLAN is correct, the link is up but everything is silent, check if the port is the first port with that VLAN on the switch. If so then maybe the trunk is missing that particular VLAN. Let Netsupport add the VLAN to the trunk. Is the DHCP-server out of free leases? If you have a link but do not get an address via DHCP then perhaps the DHCP-server are out of leases for your VLAN. You must contact your Local IT (which could be helpdesk@bmc.uu.se or someone else) to check what is going on. If it looks there are free leases but when it still do not work let the Local IT send a request to servicedesk@uu.se and ask for DHCP-server-logs for that particular MAC-address. Is the computer in the whitelist? If this is the first time you are connecting this particular computer, maybe your computers MAC-address has not been included in the DHCP whitelist. This is a list of computers that are allowed to connect to the network. Again you must contact your Local IT (which could be helpdesk@bmc.uu.se or someone else) to check what is going on. Does the network not have a DHCP-server at all, or maybe a local one? 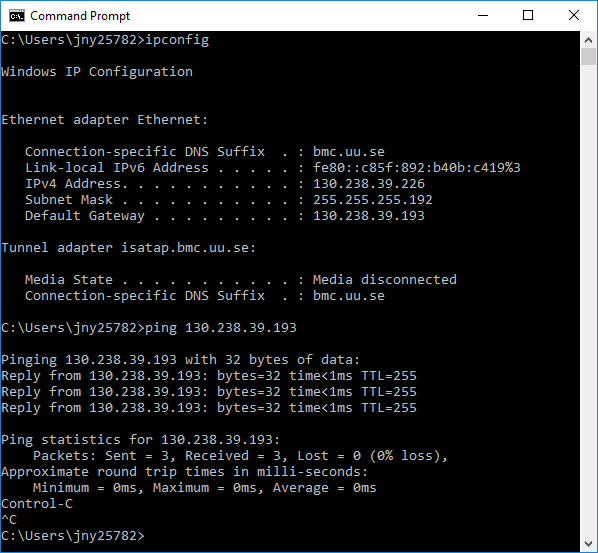 Is the default gateway address wrong? Do you have a gateway? route print (Windows), ipconfig (Windows) netstat -nr (Mac) or route (Linux). If you got an IP-address but cannot reach the gateway maybe there are old firewall rules that are blocking your IP. Check with your Local IT (which could be helpdesk@bmc.uu.se or someone else) and then let them check with Netsupport or Security Division. Can the gateway be reached? Can you reach outside the gateway (router)? If this is not working this might also be a problem with router filters or firewall rules. Are the network settings correct on the computer? Check Internet settings. Here is a guide at Microsoft for Windows. Does the computer work on another IP? Maybe the IP you are trying to use is already in use. Please check arpwatch/NetDB. Maybe the IP is blocked in the university firewall. Please check with Security division. Is this a virtual machine that has been cloned? Check that you are using a unique MAC-address and unique IP-address for the cloned virtual machine. Otherwise the cloned machines will steal the addresses from each other which will make the network work erratically. If most things look OK but the computer can not connect to Internet anyway, they maybe the TCP/IP-stack needs to be reset. 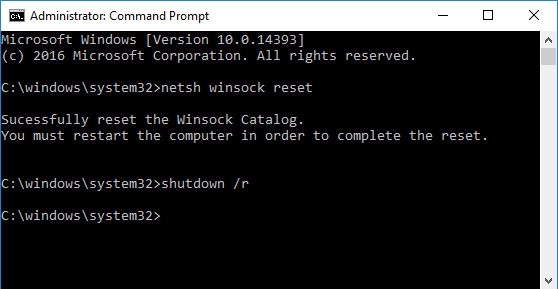 In Windows 7/8/10the command for doing this (as an administrator) is netsh winsock reset. Follow up by a restart of the computer. To reset the firewall rules in Windows 10/8/7/Vista type netsh advfirewall reset as an administrator at the command line. Look up the computer login logs for standard Windows clients. Search for the user and the computers. Here you can find the computer name and the username. Look up the computer name in Active Directory. In the description you can find the computer model and the MAC-address used for installation. Look up the MAC-address in NetDB. Here you can find the IP-address, swith name and switch port. Look up the MAC-address in IPAM (BlueCat). Here you can find if the computer is in a DHCP whitelist or any other DHCP-configuration related to the computer. Look up the IP-address in NetReg. Here you can find VLAN number and VLAN name and the ACL (router filter) for the VLAN. Look up the Switch and SwitchPort in the network documentation Excel-sheets at BMC. Here you can find the cross connect cabinet ID and network socket ID. Look up the MAC-address in Arptrack. Here you can find previous arpwatch log entries.